With a unique selection of strung and unstrung frames, they're great for players of all skill levels. Select from a variety of frame materials, including graphite and aluminum. Babolat racquet grips are designed with a sticky texture for a confident hold. Some come with visual markers to promote proper hand positioning. Browse a wide range of products offered by Babolat right here at the Sun & Sand Sports online store and stay on the top of your racquet game. Experienced players who want a more custom feel on the court should select an unstrung racquet. 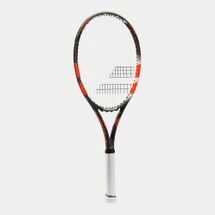 Then they can select from innovative Babolat string constructions that offer the excellent feel and response on impact. You can also personalize the grip of your racquet with Babolat replacement grip and overgrips, while Babolat junior tennis racquets are perfect for youth players. They're lightweight, compact and pre-strung so youngsters can hone their fundamentals on the court. Consult product information for details on your new racquet. Babolat racquets are designed to suit specific swing types. These swing categories include fast and long, moderate, and short and compact. Elevate your game with the entire collection of tennis equipment at the Sun & Sand Sports online store. Shop from home and have your racquets delivered to your home in and elsewhere in too.